Sunday Breakfast Rescue Mission was established with a simple goal in mind: to serve breakfast every Sunday to Philadelphia’s poor and homeless while sharing with them the love of Jesus Christ. 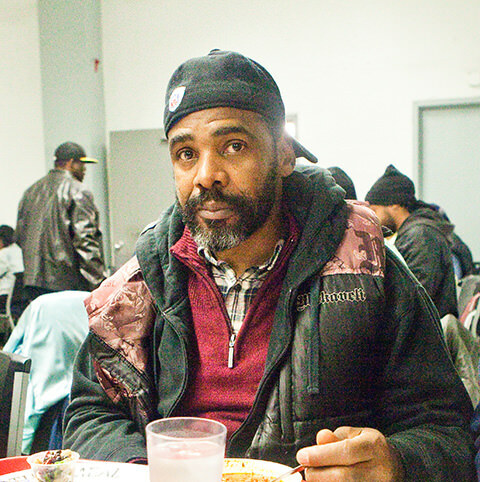 Since the Mission’s founding in 1878, Sunday Breakfast has grown to be the largest emergency homeless shelter in Philadelphia, and the only provider of the three free meals a day, 365 days a year to homeless men, women, and children. Sunday Breakfast has become a safe haven for the homeless community by ministering to the mind, body, and spirit of anyone who walks through our doors. Well-known businessmen John Wanamaker (Wanamaker’s Department Store); John B. Stetson (Stetson Hat Co.); W. Atlee Burpee (Burpee Seed Co.); and former Gov. James Pollock established the Sunday Breakfast Association. More than 250 men attended the first meeting at 11th and Wood streets, where they were served a hot cup of coffee and a roll before church. More than 500 men attend the Sunday Breakfast Association meetings weekly. This inspires the founders to start a Bible study, and form a committee to find ways to lodge and assist the homeless. The Sunday Breakfast Association hosts The New Year’s Dinner with 1,200 guests. The radio ministry begins, and each Sunday a service is broadcasted on WPEN. To accommodate the victims of The Great Depression, the board purchases a building at 1120 Vine Street to house more people in need. The Mission moved to 6th and Vine streets. This building contained 800 beds, and became the largest gospel rescue mission on the East Coast. Other features included a chapel, an industrial work area, a playground for neighborhood children, and a thrift store for families. Sunday Breakfast Rescue Mission continues to welcome guests of all ethnic backgrounds, despite racial tensions running high in America. Founded in 1878, we have reached out to the homeless in Philadelphia for more than 140 years. The building at 6th and Vine streets closed to make way for city improvements and the construction of the Vine Street Expressway. At that time, the Mission moved to its current location at 302 N. 13th Street. The long-term Overcomer Program, a recovery program for homeless men, is established. The goal of the program is to encourage men in their walk with the Lord, while equipping them with the practical life skills they need to be self-sufficient individuals and positive contributors to society. Sunday Breakfast Rescue Mission opens Wayne Hall – a safe house for women and children living in poverty. The BeeHive and BeeHive Too Thrift Stores open in the North East region of the city. Penndel Thrift Store opens in Bucks County, making this the third thrift store owned by Sunday Breakfast Rescue Mission. The Bucks County Outreach Program is established at the Penndel Thrift Store to assist those living in homelessness or battling poverty in the suburbs of Philadelphia. The Bucks County Outreach Program opens a furniture bank in the Penndel Thrift Store to provide furniture, household items, and clothing to the formerly homeless as they transition into housing. The Mission starts the Montgomery County Outreach Program, which operates out of Abington Baptist Church in Montgomery County, to continue its efforts of helping the homeless and those living in poverty in suburban Philadelphia. In partnership with The Asian Arts Initiative, Sunday Breakfast Rescue Mission builds an urban farm at its emergency shelter at 13th and Vine streets. The farm helps provide fresh fruits and vegetables for meals served at the Mission.